We went to llangollen for a special day trip the other Sunday, From where we are was around a 1hr 30min drive, Llangollen is a small town in North Wales, the river Dee runs through the town, it is a very Beautiful place, the view of the river dee from the Llangollen bridge is spectacular, on the one side of the bridge is the train station, you can take a stream train trip through the Dee valley, we didn’t go on this as was £11 each and would have took around 2hours. We decided to go on the horse drawn canal boat ride. this leaves from the Canal wharf, this takes around 45mins on a trip down the canal, because it is pulled by a horse the ride is very smooth and very quite, the price was £6 each adult. It is a very nice relaxing trip, but can be a bit boring as the trip is I would say about a mile, but you see the same scenery. There is also another trip that leaves from the canal wharf that goes over the Llangollen Aqueduct, not sure of the price of this but the journey is approx 2.5hrs. We then spent some time looking around the shop, I have to admit it is a lovely town, We then took a trip up the horseshoe pass, It is great driving up there with great views, we stopped at a layby just near the top, the view from the top is just spectactular you can see the whole valley and all the surronding areas for miles. Going towards trhe horseshoe pass there is also the ruins of a Abbey, sorry not sure of the name at time of writing. Just outside of the town there is the horseshoe falls, it took us a few attempts to find this, it is just off the A5 towards Berwyn and behind a little hotel / pub, the river runs behind the hotel, if you walk for approx 10mins to the right of the hotel then you come to the man made horseshoe fall this is a large semi circle waterfall, approx 2-4ft high, this would be a great place just to relax as loads of open grassland to just sit and relax. 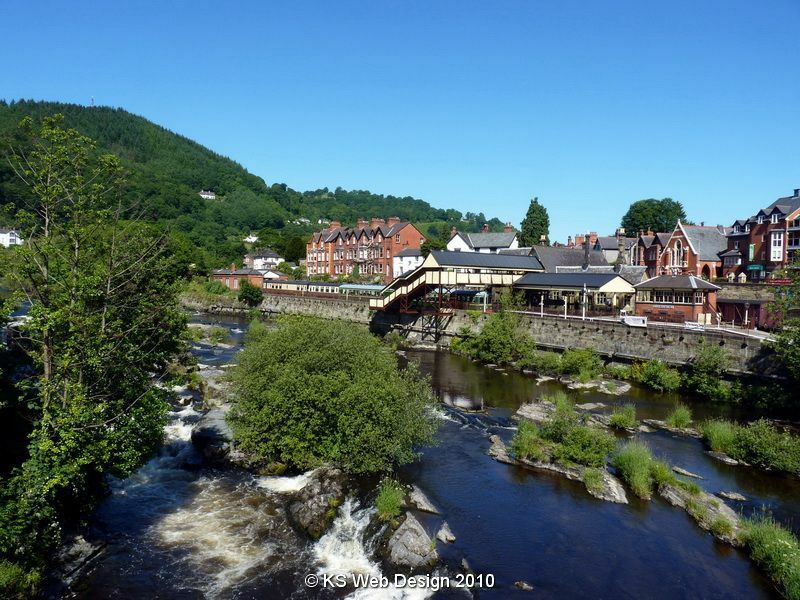 Llangollen is a great place to visit for the day or even a few days, my only critism is that there are no road or street signs directing you to all the different attractions. From Llangollen we decided to visit another waterfall that was close by, I had seen a picture on a postcard from one of the shops, so look on the net on my phone (that’s when i could get a signal 🙂 and found the website, the place was called Pistyll Rhaeadr, on the website it said was in a town called Llanrhaeadr, so i had copied and pasted this name into the googlemaps on my phone, and gave me directions, but this is where a few problems started, as the googlemaps said it was north of Llangollen approx 15miles, so again over the horseshoe pass and we eventually after all the winding roads got to Llanrhaeadr, but unfortunately after speaking to a few people in this very small village we was in the wrong Llanrhaeadr, as there are two places of the same name by Llangollen. Eventually after going back over the horseshoe pass, back trough Llangollen, and back on the A5, went trough Oswestry and then onto the correct village of Llanrhaeadr, it is at the end of a very tight windy road at times we wasn’t sure if heading in the right direction, but when we pulled up was really worth the wait, The Pistyll Rhaeadr waterfall is a amazing sight it is approx 80 mtrs high and is just spectacular to look up from the bottom of the waterfall to the top, there is a little bridge that runs across the bottom the the waterfall stream. Three of the four of us decided to walk to the top, if you are going to visit and want to walk to the top be warned is a very long and tiring walk, and would recommend good footwear and having a drink. It is well worth going to the top as the views of the surrounding Berwyn Mountains, and even some more smaller waterfalls at the top that you cannot see from the bottom. See my photos from the day out by clicking the photo’s below or go to my full photo albums from the menu link at top of page. All in all was a great day out, but a very long day out. I would definitely recommend anyone looking for a day out or if passing in the area. 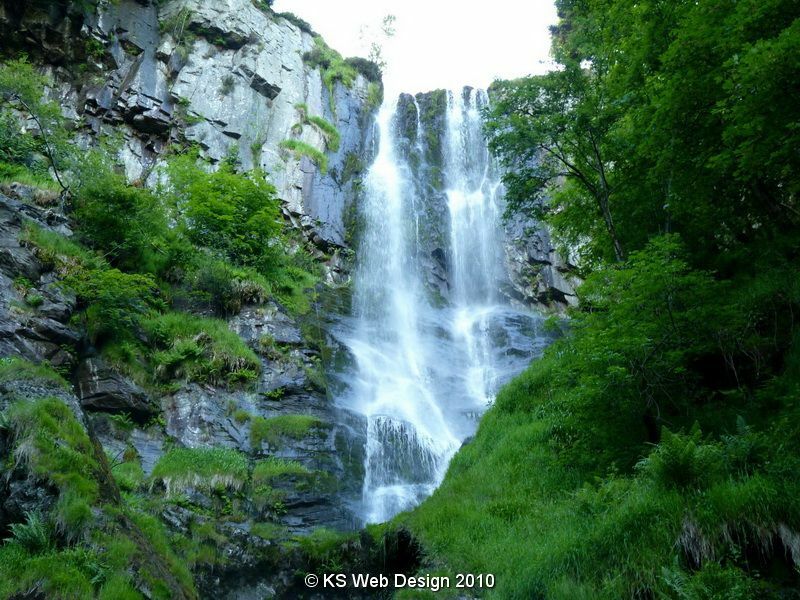 to have a visit to Llangollen and even more the Pistyll Rhaeadr waterfall as you wont be disappointed with the amazing views.